You have decided to install an in ground trampoline, but you are worried about the rains. Many people are just like you. They like the idea of having an in ground trampoline yet they are not sure about the heavy rains their geographical region gets each year. A lot of rain can do a lot of damage to an in ground trampoline. That is if you don't install a good drainage system. Digging the hole according to expert’s direction is not enough. You need a good drainage system to guide the water away from your trampoline. That is what this article is all about. It is filled with information on how to build a good drainage system, including tips and suggestions. Rain, snow or water in general can cause a few problems for you after you install your in ground trampoline. The water builds up in your inner trampoline hole and threatens to bring rust and corrosion to your trampoline’s metal frame. Previously, we had written that there were only two basic drainage options available. That was because everywhere we researched the information only spoke of those two options..
1. The soak away option- this is probably the cheapest and easiest way to install a drainage system. All you have to do is dig your inner hole a little deeper than recommended. Then you fill it with drain rock or other easy drain materials. 2. Temporary pump option- this is where you get a small easy to use water pump and put the hose down into the trampoline hole. Then you put the exit hose where it can safely drain the water out of the hole. 3. The permanent pump option- you know what a sump pump is. They can be called submersible pumps also. All you have to do is dig a smaller hole in the inner hole and pl;ace the sump pump inside. Then dig a permanent electric cable channel to hold the electric cord. Now you can leave it plugged in and let a water float handle the on and off duties or you can use a switch and turn the pump o yourself when it is needed. 4. The drain pipe option- it is not hard to install this option. It just takes a little more digging,making sure you dig the channel at the right downward angle. A 4” pipe is recommended for this task and it needs to be placed at the bottom of the the inner hole. You can get creative and use an elbow to make sure all the water in the inner hole drains out. Connecting this pipe to an existing sewer drain, gutter, etc. is the best way to go. Tip #2: while you want your trampoline to be level, you should put a very slight angle to your outer hole ledge. This will help drain the water into the inner hole and protect your trampoline. Tip #3: it is recommended that you put a mesh net or other mesh material over the openings of your drain pipe. This will keep debris out and keep the pipe from clogging up. It is tough living on a budget, but for most of use that is how we have to live. Yet being on a budget does not mean you cannot have an in ground trampoline or install a good drainage system. What is going to cost you the most when you construct a drainage system is the amount of digging that has to be done. Digging is not easy work and you may want to rent a mini-digger. Mini-diggers cost money to rent and to replace the used fuel. Plus, they are not always good for the environment and it is easy to make a mistake. Those mistakes may cost you more in the long run. When you are on a budget, manual digging is the most economical way to go. You can do it yourself and save a lot of money. Or you can ask a friend to help. When you manually dig your inner and outer hole, you have two inexpensive drain options. First, you can just dig your inner hole a little deeper. This will not cost a lot but only use up a little more time. Then fill the extra hole with some drain rock. The small amount you will be using should also not cost you a lot of money. Or you can find a cheaper gravel option. Second, the next cheapest way to construct a drainage system for your in ground trampoline is to dig a little drain channel and install a length of 4” pipe. The pipe should not cost a lot of money and digging the channel is only a little extra time and effort. Tip #4: there is a third option available for you. It is called the wait and see solution. This is where you dig your inner hole and install your trampoline, then wait and see if you have a drainage problem. If you don’t, then you have saved yourself some money. 1. An above ground pump - these little pumps should cost you less than $100 to purchase. All you have to do is feed one end of the drain hose into the the inner hole. Then attach the other end to the pump. Attach the exit hose to the other end and lay it out in the direction you want the water to go in. Then just turn the pump on and let it handle the job. 2. 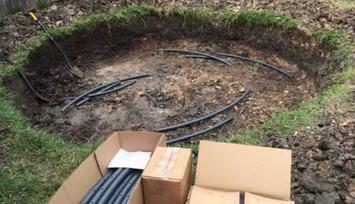 The French Drain option - If you did not dig a channel to hold a drain pipe when you were installing your in ground trampoline, you are going to do it now. Obviously you start at the lower part where you want the drain pipe to end. You dig a channel back towards your in ground trampoline. Before you break the dirt barrier between the inner hole and your channel, you need to lay your drainpipe. You should use a perforated plastic pipe and a filter cloth. The cloth helps keep debris out as the water drains. Slowly break the barrier to the standing water and hook up the drain pipe.. It is okay if some of the water does not drain into the pipe. This will take a little time to do and your costs will be kept to a minimum. Tip #5: You are free to design your own drainage system that works for you. If the above options do not work for you, try and be creative but safe. Also, check with your local city government to make sure there are no regulations governing how a drain system for in ground pools should work. One of the problems that has not been discussed recently is the issue of weeds. When you install your in ground trampoline, you are removing the grass top layer and opening up the ground underneath to more moisture, etc. Your grass may not grow again. Weeds, on the other hand, are a different story. They can and will grow when given the opportunity. The exposed dirt on your outer hole ledge and the inner hole walls are prime opportunities for weeds to exploit. #1. What won’t work-- You may have heard about or used garden weed barriers to help your plants to grow without the interference of weeds. These weed barriers are great for gardens because they leave holes for plants to grow, get moisture and sunlight. If you use this material in your in ground trampoline holes, then you are still leaving opportunities for weeds to grow. The holes keep a spot open for them. #2. Black plastic- heavy duty black plastic will work. It keeps the moisture, sunlight and nutrients away from the ground underneath your trampoline. The key to using black plastic though is to make sure it does not hinder your drainage or ventilation. Black plastic is fairly inexpensive and easy top lay down. Just do not get the perforated version or you are shooting your weed stopping efforts in the foot. #3. Landscape fabric- this is an option but unlike black plastic it does allow moisture and nutrients to enter the ground underneath it. This action allows the weeds to get the food they need to grow strong and continue their effort to grow. #5. Crushed stone- this weed barrier won’t decompose. 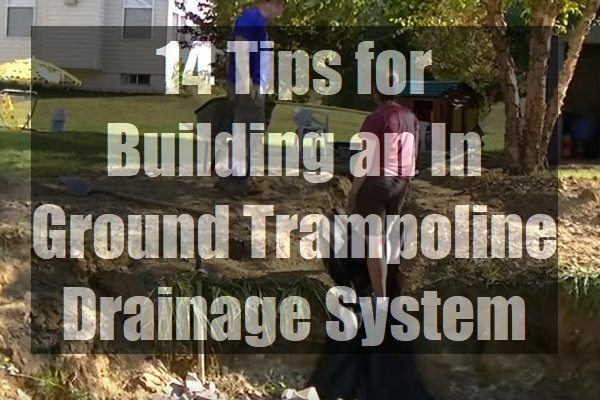 It is strong and may even help your drainage system get rid of excess water from your in ground trampoline hole. A word of caution- it is possible that you may never win against weeds. No matter what fabric you place underneath your in ground trampoline, there are those never say die tough weeds that keep going until they find a weak spot to exploit. If the weeds grow from rhizomes or stolons then you should kill those rhizomes or stolons first before laying down your weed barrier. Tip #7: If you are going to install a weed barrier, make sure to lay the barrier down first before installing your trampoline. You want the trampoline to hold the barrier in place. Then lay the plastic or fabric in such a way that it directs any water towards your drainage system. Make sure it lays smooth and has no wrinkles of hills in it. Those wrinkles and hills will block water from moving towards your drain system. Let’s put your mind at ease. Now that you read this article you may think that installing a drainage system is too much work and a lot of hassle. But like most dogs, the bark is worse then the bite. Everything can be done as you go and should not extend your installation time by too many hours. Digging the drainage channel for your pipe will take the longest amount of time. Installing a weed barrier doesn’t take a lot of time. You just have to make sure it remains smooth and has no openings for weeds to get through. Don’t worry about being on a budget, Most of the ideas and solutions mentioned in this article do not cost a lot of money. It doesn’t take a lot to make sure your in ground trampoline has proper drainage protecting it.